How I think we could make NZ's quality public education system better. 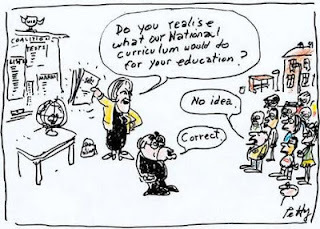 National and Act have spent the last however many years telling you and I that there is a crisis in education. They will tell you that one in five children leave school without being able to read and write. They will tell you that the unions are protecting bad teachers. They will tell you teachers are only in teaching for the money and holidays (sorry.... just choking a bit on that one). They will tell you that the state system in New Zealand is not doing a good enough job for Maori and Pacific Island children. They will tell you that National Standards will raise your child's achievement levels. They will tell you that teachers do not make good assessments of where your child is at, so we need a new tool called PaCT (Progress and Consistency Tool). They will tell you that Charter Schools with unregistered and untrained teachers will provide you with more choice and will solve our tail of underachievement and low achievement rates for Maori and Pacifica children. So now that I have told you everything that National and Act have had to say about what is wrong with our quality public education system, I am going to tell you how we could improve our quality public education system even more (in my view) using the monies currently being spent on National Standards, PaCT and other testing regimes in progress, and Charter Schools. We need to cap all class sizes. We need to make sure that all junior classes, years 1-3, are no larger than 18 students, and year 4-8 classes have no more than 25 students. Schools may be staffed for that now, but by the time you take out a walking principal and one or two or more DPs that bumps up the number of kids in each class. So senior management staffing should be over and above the teaching staff once a certain roll number kicks in. We need more teacher aides and they need quality training and they should get paid better. Teacher aides are important in individual classrooms as they are that extra pair of eyes when a teacher is focused in on an ability group. A teacher aide can support the struggling students while the teacher concentrates on the whole class. A teacher aide can take individuals and small groups for targeted learning designed by the teacher. A good teacher aide helps a teacher ensure that no child is left behind, that all children get the best possible education they can get, that everything possible has been done to help each child learn to the best of their ability. A good teacher aide is worth their weight in gold. Probably the most important parts of a day for a teacher is running the ability groups for reading, writing and numeracy. Yes they set up activities and work for the other kids to do while they are running these programmes, but while the teacher is focused on one group or an individual, who is helping the rest of the kids when they need it? That's where a teacher aide is worth their weight in gold - they help keep the other kids on track meaning learning continues and behaviour management issues are minimised. Teacher aides are paid poorly, have poor job security and very rarely get training officially. They do a hard job, often working with the slowest kids every day, and sometimes with kids that have behavioural problems or communication or soiling issues. They are the like that old adage "the woman behind the man" because they often do a lot of things to make a classroom successful and a teacher do a good job and kids learn. The kids that are diagnosed with a learning disability need better special needs support. Over the years I have taught plenty of kids who struggle with learning. 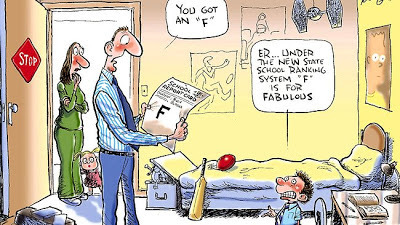 It is not necessarily because a teacher has failed them, because most of the individual children who have come into my class with this struggle already have had numerous IEPs, teacher aide help, targeted teaching, referrals to RTLBs and RTLits and are likely to or have been referred to CDC (Child Development Centre at Waikato Hospital). Some have also been to Speld and other after school learning centres like Kip McGrath or Numberworks. Currently I have a number of students with special learning needs . One is ORS (Ongoing Resourse Scheme) as he has Downs Syndrome. He has a full time teacher's aide, support from Special Education (although this is so watered down it is not funny), and his parents pay for private speech language therapy as he doesn't talk like other kids. There is funding and support for him, which is great, even though we still have to push to get things. And then I have two children diagnosed by CDC as intellectually impaired. Their academic performance is five years below their age, but because they can feed, dress, toilet themselves and sit there nicely there is no additional funding or help for them. They have been through the RTLB/RTLit thing and we are doing it again. However, they require a lot of input, and that means I am not with the other groups or the rest of the class, because their needs are time consuming. And then I have three other strugglers. They cause me great concern too. Their parents have put love and time into them. They have had help at school through programmes like reading recovery and teacher aide time. One of them goes to Speld because the parents believe it is worth it (and I fully support them because they bring another element to learning that I can not provide in a school setting). But there is no funding to do what I would really like to do to boost them. They are not considered serious enough for a referral to RTLB or RTLit. But again, these kids require targeted teaching, time consuming teaching, which again takes me away from other learners. These kids are not like this because of bad teaching. These kids are like this because this is who they are. This is how their brains work. These children have their own individual issues that the 'system' is unable to cater to due to lack of money/resources/personnel. That is six children out of nineteen in a multi-level year 4-8 class. That is one third of my class. I have only had these children a few months. I am still getting to know them. I have done testing up to their gills. I am implementing programmes and activities based on their needs. And it takes up more than half my teaching and prep time. But each one of these children needs more time than I have to give. I still have thirteen other children and their education to consider. So how do we solve this? 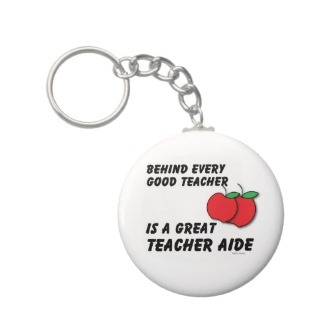 Well more teacher aides, as I have discussed above, would be great. More RTLBs and RTLits and actually having them work with the individuals (like they did originally, but that has been swept away with ongoing restructuring). Widen the ORS funding (or any funding) for kids who are going to have ongoing issues due to learning needs that won't change. My two students with an intellectual impairment are not going to lose that impairment over night.... it is permanent! Schools need better ICT funding. Parents expect computers in classrooms. Now they expect to see I-pads or tablets and/or laptops. They cost money, but they are needed so that these children have access to information and can present their learning in a variety of ways. Data projectors have become essential teaching and learning tools. You can learn anything on You Tube now! The other day we looked up how to make sock puppets and got a fantastic tip! Data projectors have also almost made the old OHPs obsolete (but I would still use one)!! Now you can scan your worksheets and have them on your computer to shine up on a screen to discuss with the kids. Cameras are essential to allow the teacher to capture learning moments and for students to create learning moments. 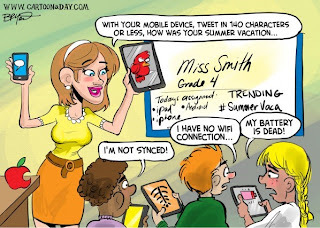 Some classes can use I-pads, I-pods, tablets and smart phones to do this. Students and teachers are capturing these moments as either still pictures or as video. They manipulate these using their computers into wonderful multi-media presentations. There are many other exciting things to be used in a classroom for ICT as well.... but like the money each school has to spend on ICT, but time is limited to wax lyrical about ICT. The government should just fork out for in direct ICT funding. Unfortunately they do not do this currently. They merely pay lip service as to how important ICT is in learning.... but don't stump up with actual cash. 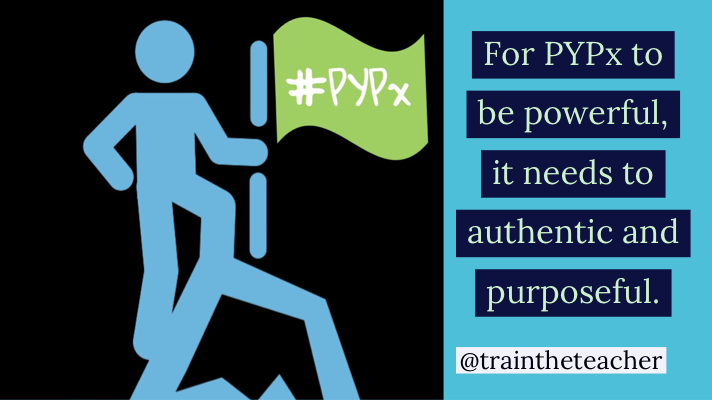 Teachers need quality professional learning opportunities. In the '90s the National government of the day dismantled the advisory service. Labour reinstated it when they came back in in 1999. It didn't take long for National to destroy it in a nuclear way after they got back in in 2008. Choice for individual teachers to up skill in areas like science, the arts, social sciences, languages, health and physical education has been removed in favour of school wide delivery of literacy and numeracy screwed in emphasis to the National Standards. I think that developing people's ability to teach literacy and numeracy is important, but for better teaching... not to reach some dodgy ill informed standard. Teachers need time to do quality testing and assessment - that means more release time. When two days/ten hours per term of CRT (classroom release time) was established for primary teachers in 2003 it was planned to be the beginning the of winning further release time for teachers to plan, test, do boring paperwork, take time to observe other teachers demonstrating good practice, etc. Ten years later we still have the same amount of time for CRT, no increase. My two days of CRT a term are used solely for testing. I don't get through all the kids. I don't get time to record the results and feed back to the kids like I would like. Planning doesn't happen, neither does boring paperwork and I don't get to go into other classes. I work like crazy to get through all the kids and spend one-on-one time with each child to make them feel comfortable about the process. Rushing tests doesn't bring out the best in children. Children need good food in their stomachs to learn. Therefore a school lunch programme should be implemented. 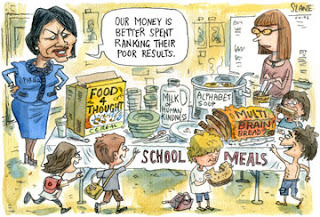 I am encouraged by the breakfast programme announced recently by John Key in conjunction with Fonterra and Sanitarium. However I feel that a mere $9.5 million by the government over five years is pitiful. That's less than $2 million a year! I taught in England for a year and the majority of schools provided an option for children to get a school lunch. Scandanavian countries, including Sweden, have school lunch programmes. Japan has a school lunch programme. Yet in New Zealand we hear calls that it should be the parents responsibility. One school in Putaruru, Te Wharekura O Te Kaokaoroa O Patetere, provides breakfast and lunch to its students for $10 a week per student. The principal, Keith Silveira said providing meals was not a response to poverty but to make sure children were eating well. He said a major benefit was the students having among the lowest rate of tooth decay and dental work in the Waikato because they were not exposed to junk food. He said it also made life easier for parents and instilled responsibility in the children, who were also rostered on either set-up or clean-up duties. Clearly though, well nourished children will have a better capacity to learn and a child with a full stomach will tend to have less behaviour problems. Low dental decay is an obvious bonus. Also another bonus is how the scheme is able to instill in the children a sense of service to the school and their school mates by participating in preparing and cleaning up from the meals. Eating at school can also develop the students' social skills. 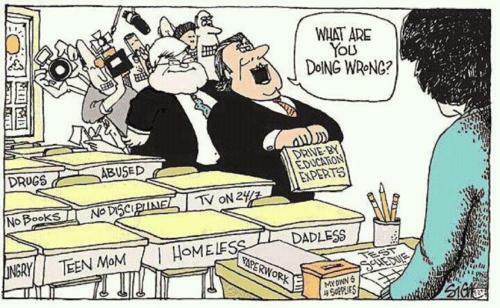 Don't go down the standardised testing line and get rid of National Standards. Part of the GERM agenda is to tell you that students are failing, leaving school without basic skills like reading, writing and numeracy. The GERMers will also tell you that teachers are ineffective, lazy and their unions are just protecting their jobs. The GERMers will tell you that we need to measure childrens' learning, and therefore measure how effective the practice of a teacher is. It labels children, especially children who struggle. By publishing the data, individual children risk having their privacy breached. The government insists that even special needs children should be assessed using the Standards, and even Special Schools should produce data against the Standards. What is the point of an ORS funded student being assessed against the Standards? It's not like their Downs Syndrome (or whatever) is going to be cured by the National Standards!!! It is just plain stupidness on so many levels!!! Grrrr!!! It doesn't tell teachers anything they didn't already know and doesn't really inform future learning. It allows schools to be ranked and labelled on the basis of data that is not standardise and means schools of different socio-economic areas are compared to each other, thus creating loser and winner schools, failing schools and magnet schools. It does not take account of where each individual child has come from, how much progress they have made or their individual learning challenges. It narrows the school curriculum and kills creativity. The teaching of science, social sciences, technology, health, PE, the arts and languages have truly taken a battering over this. Critical thinking is lost in the classroom as it is more important to pass the tests. Teaching to the test becomes the modus operandi in schools rather than teaching to the individual needs of each child. The creation of failing schools opens the door to the charter/partnership school model which then commercialises schooling, opening up children to an untried curriculum and unqualified/unregistered teachers. There is no conclusive evidence that shows charter schools are better than public schools. In fact the evidence shows their effectiveness is the same or worse than public schools. The use of the data to assess the effectiveness of teachers opening the door to performance pay - which has been shown not to improve the outcomes of students, but has been shown to squash collegiality which consequently isolates teachers and means they can not support each other to become better teachers or improve student outcomes. National Standards is the door opener to national testing like NAPLAN in Australia (which people are now waking up to what a clanger that is), and national testing in the US and UK. The PaCT tool is the next step National is making in the move towards national testing. Again this will narrow the curriculum, create teaching to the test scenarios (which I witnessed blatantly in the UK) and undermines the professionalism of teachers to be able to teach to the needs of the individual child. Well, I tried to make the list short. I guess I failed the standard on short lists. For more reading on why National Standards, national testing, charter schools, performance pay and lots of other educational things of interest check out Dianne's blog Save Our Schools New Zealand, Allan Alach's blogs on The Daily Blog and The Treehorn Express, Education Aotearoa (for a variety of education focused musings), Kelvin Smythe's Networkonnet and Bruce Hammond's Leading the Learning (which Allan Alach also contributes too and covers a wide area of educational interests). Refocus on our world leading, well researched and trialled, New Zealand Curriculum!! This really is a no brainer. It has been hailed throughout the world as one of the best curriculums around.... but before it could truly be implemented and bedded it, it was pushed to the side-lines by that stupid idea of National Standards. This curriculum aims to develop the whole child, not just in literacy and numeracy, but in the arts and sciences.... and so on. It's aim was to develop a person with critical thinking skills, who could problem solve and work independently or as part of a group - a person who could contribute to wider society and help to improve society for the better. Instead we got National Standards forced upon us, which disregards critical thinking, has a basis of everyone for themselves and will turn out fodder for employers who want people who will just do as they are told and work for peanuts. This little blog baby has been brewing for several months. These are my opinions, but I would appreciate your constructive evaluation of these opinions and any other suggestions you have for how we can make our quality public education system even better!! (Please play the ball and not the man in being constructive).